I looked at the map with a critical eye, and it seemed like a good opportunity to highlight some issues with spatial data analysis, cartographic techniques, and map interpretation – hence this post. New York’s stop and frisk program is such a high profile and charged issue: maps could be helpful in illuminating the controversy, or they could further confuse things if not done right. In my view the WNYC map falls into the latter category, and I offer some critical perspectives below. WNYC’s map seems to show an inverse relationship between stop and frisks and gun recovery, and you can infer that perhaps the program is working (it’s acting as a deterrent to guns) or it’s not (as WNYC argues, “police aren’t finding guns where they’re looking the hardest”). But as a map, I don’t think it holds up well, and with a closer look at the data and a reworking of the map, the spatial patterns of gun recovery and stop and frisks appear to overlap. That said, the data on gun recovery is so slim that it’s hard to develop a map that reveals meaningful relationships. Other visualizations make the point much better; the map just risks obscuring the issue. When we’re dealing with such an important — and controversial — issue, obscuring things is not what we want. Clarity is paramount. I also make some other points about cartographic techniques (diverging vs. sequential color schemes, black light poster graphics vs. more traditional map displays). And I note that there’s so much more to the stop and frisk data that simply overlaying gun recovery locations compared with annual counts of stop and frisks seems like it will miss all sorts of interesting, and perhaps revealing, patterns. the third uses a density grid technique that ignores artificial Census block boundaries and highlights the general areas with concentrated stop and frisk activity, overlain with gun recoveries to show that the spatial patterns are similar. We located all the “hot spots” where stop and frisks are concentrated in the city, and found that most guns were recovered on people outside those hot spots—meaning police aren’t finding guns where they’re looking the hardest. The map uses a fluorescent color scheme to show the pattern, by Census block, of the number of stop and frisk incidents in 2011 compared with point locations mapped in fluorescent green to show the number of stop and frisks that resulted in gun recovery. The map is striking, no question. And at first glance it appears to support the article’s point that guns are being recovered in different locations from the “hot spots” of stop, question, and frisk incidents. But let’s dig a bit deeper. Do the data justify a map? This is a situation where I don’t think I would’ve made a map in the first place. The overall point – that the number of guns recovered by stop and frisks in New York is infinitesimally small compared to the number of stop and frisk incidents, putting the whole program into question – is important. But precisely because the number of gun recovery incidents is so small (less than 800 in 2011 vs. more than 685,000 stop and frisks), it makes it unlikely that we’ll see a meaningful spatial pattern, especially at the very local level (in this case, Census blocks which form the basis of WNYC’s map). If we made a map, how would we represent the data? For the point of this blog post, though, let’s assume the data is worth mapping. WNYC’s map uses the choropleth technique (color shading varies in intensity corresponding to the intensity of the underlying data), and they use an “equal interval” approach to classify the data. They determined the number of stop and frisk incidents by Census block and assigned colors to the map by dividing the number of stop and frisks per block into equal categories: 1 to 100, 100 to 200, 200 to 300, and 400 and above. this accounts for only 10% of the 779 stop and frisks that resulted in gun recoveries in that year. But you could argue that not only is the WNYC definition of a “hot spot” arbitrary, but it’s very narrow. Their “hot spot” blocks accounted for about 129,000 stop and frisks, or only 19% of the incidents that had location coordinates (665,377 stop and frisks in 2011). These blocks also represent less than 1% (just 0.66%) of the 39,148 Census blocks in the city, so these are extreme hot spots. 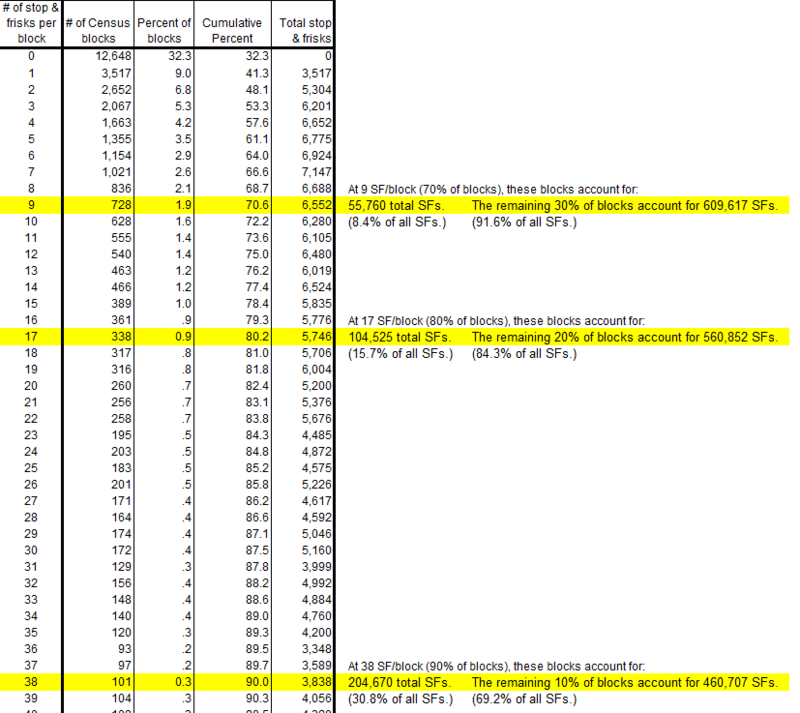 The underlying data do not show any obvious reason to use 300 (or 200 or 400) as the threshold for a hot spot – there’s no “natural break” in the data at 300 stop and frisks per block, for example, and choosing the top “0.66%” of blocks rather than just 1%, or 5%, or 10% of blocks doesn’t seem to fit any statistical rationale or spatial pattern. If we think of hot spots as areas (not individual Census blocks) where most of the stop and frisk activity is taking place, while also being relatively concentrated geographically, a different picture emerges and WNYC’s conclusion doesn’t hold up. Creating a meaningful choropleth map involves a balancing act of choosing thresholds, or range breaks, that follow breaks in the data and also reveal interesting spatial patterns (geographic concentration, dispersion, etc) while being easy to comprehend by your map readers. Click the image for a high-resolution version. Almost a third have no incidents. 70% of blocks have less than 9 incidents each while the remaining 30% of blocks account for almost 610,000 incidents (92%). 80% of blocks have less than 17 stop and frisks each, while the remaining 20% account for 560,000 incidents (almost 85%). 90% of the blocks have 38 or fewer incidents, while the remaining 10% account for 460,000 incidents (just under 70% of all stop and frisks). In the choropleth balancing act, I would say that a threshold of 9 or 17 stop and frisks per block is low, and results in too many blocks color-coded as “hot”. A threshold of 38 reveals the geographic concentrations, follows a natural break in the data, and uses an easily understood construct: 10% of the blocks accounting for 70% of the stop and frisks. quantitatively the second map reveals that most gun recoveries in 2011 were in Census blocks where most of the stop and frisks took place (the opposite of WNYC’s conclusion). The pink-to-hot pink blocks in the second map account for 433 recovered guns, or 56% of the total in 2011. I’m not defending the NYPD’s use of stop and frisks; I’m simply noting that a change in the way a map is constructed (and in this case, changed to more closely reflect the underlying data patterns) can substantially alter the conclusion you would make based on the spatial relationships. If I wanted to compare the stop and frisk incidents to population density, then I’d use Census blocks. But that’s not necessarily relevant here (stop and frisks may have more to do with where people shop, work, or recreate than where they live). It might be more appropriate to aggregate and map the number of stop and frisks by neighborhood (if your theory is to understand the neighborhood dynamics that may relate to this policing technique), or perhaps by Community Board (if there are land use planning issues at stake), or by Police Precinct (since that’s how the NYPD organizes their activities). Were the stop and frisks organized geographically by Census block in the first place, or were they conducted along a street (which might be straddled by two Census blocks) or perhaps within a given neighborhood in a circular pattern over time around a specific location in the hopes of targeting suspects believed to be concealing weapons, that resulted in a single gun recovery preceded by many area-wide stop and frisks? In other words, I’m concerned that it’s arbitrary to argue that a gun recovery has to be located within a Census block to be related to only the stop and frisks within that same block. Also, we need to know more about the NYPD’s geocoding process. For example, how were stop and frisks at street intersections assigned latitude/longitude coordinates? If the intersection is a common node for four Census blocks, were the stop and frisks allocated to one of those blocks, or dispersed among all four? If the non-gun recovery stop and frisks were assigned to one block but the gun recovery stop and frisk was assigned to an immediately adjacent block, is the gun recovery unrelated to the other incidents? As I’ve noted above, the meager number of gun recoveries makes it challenging to develop meaningful spatial theories. But if I were mapping this data, I’d probably use a hot spot technique that ignored Census geography and followed the overall contours of the stop and frisk patterns. Density maps, for example, show where crimes occur without dividing a map into regions or blocks; areas with high concentrations of crime stand out. There were so many stop and frisks in 2011 that the density numbers are high. And of course, the density grid is an interpolation of the specific locations – so it shows a continuous surface instead of discrete points (in effect, predicting where stop and frisks would take place given the other incidents in the vicinity). But it highlights the areas where stop and frisk activity was the most prevalent – the hot spots – regardless of Census geography or any other boundaries. The spatial pattern of gun recoveries generally matches the hot spots. Nonetheless, even this density map perhaps is too generalized. There are additional analyses we can do on the stop and frisk data that might result in a more precise mapping of the hot spots – techniques such as natural neighbor, kriging, and others; controlling the density surface by introducing boundaries between one concentration of incidents and others (such as highways, parks, etc); and filtering the stop and frisk data using other variables in the data set (more on that below). Lots of resources available online and off to explore. And many spatial analysts that are much more expert at these techniques than me. puts equal emphasis on mid-range critical values and extremes at both ends of the data range. The critical class or break in the middle of the legend is emphasized with light colors and low and high extremes are emphasized with dark colors that have contrasting hues. This map might be a bit boring compared to the WNYC version 🙂 but to me it’s more analytically useful. I know that recently the terrific team at MapBox put together some maps using fluorescent colors on a black background that were highly praised on Twitter and in the blogs. To me, they look neat, but they’re less useful as maps. The WNYC fluorescent colors were jarring, and the hot pink plus dark blue on the black background made the map hard to read if you’re trying to find out where things are. It’s a powerful visual statement, but I don’t think it adds any explanatory value. The stop and frisk databases from NYPD include an incredible amount of information. All sorts of characteristics of each stop and frisk are included, the time each one took place, the date, etc. And the data go back to 2003. If you’d like to develop an in-depth analysis of the data – spatially, temporally – you’ve got a lot to work with. So I think a quick and not very thorough mapping of gun recovery compared with number of stop and frisks doesn’t really do justice to what’s possible with the information. I’m sure others are trying to mine the data for all sorts of patterns. I look forward to seeing the spatial relationships. No question that a massive number of stop and frisks have been taking place in the last few years with very few resulting in gun recovery. But simply mapping the two data sets without accounting for underlying data patterns, temporal trends, and actual hot spots rather than artificial block boundaries risks jumping to conclusions that may be unwarranted. When you’re dealing with an issue as serious as individual civil rights and public safety, a simplified approach may not be enough. The WNYC map leverages a recent fad in online maps: fluorescent colors on a black background. It’s quite striking, perhaps even pretty (and I’m sure it helped draw lots of eyeballs to WNYC’s website). I think experimenting with colors and visual displays is good. But in this case I think it clouds the picture. Do the data require a map? What a question!